In the United States alone there are more than one million people enslaved today. Many of them were brought into the country by smugglers who specialize not in drugs, but in human trafficking. According to the U.S. State Department, every year between 600,000 and 800,000 people are trafficked across the country's borders, half of them are children and 8 out of 10 are female. They are a fraction of the estimated 21 million people who have been trafficked around the world according the UNICEF, and demand for slavery and cheap labor has been steadily increasing. The numbers are shocking and eye-opening, they reflect the fact that human trafficking has now become the world's fasted growing crime. In terms of scope and industry size it ranks third internationally, behind only illegal drugs and arms trafficking. The demand for cheap labor and sexual exploitation are the primary driving forces behind human trafficking. Victims are modern day slaves who are being held against their will, abused, abducted, coerced, or threatened into compliance. They face unimaginable horrors and treatment at the hands of their abusers and yet most people can't even image that this sort of crime is occurring every single day all across America, even in their own neighborhood. Part of what makes human trafficking so hard to detect and investigate is that victims are constantly being moved around. Traffickers rarely stay in one spot, instead they change locations frequently to evade law enforcement and make it super hard for authorities to track them down. That's also why they use hotel rooms. Not only do hotels afford criminals easy and convenient places to hide, they are perfect because rooms can be paid for in cash. Statistics show that the majority of all trafficking crimes take place in hotel rooms. When traffickers bring their victims to a new hotel room they usually take a picture of them and upload it online as a type of advertisement. That's where the TraffickCam App comes into play. TraffickCam takes user submitted photos of their hotel rooms and compiles them into an efficient, comparative search database. When traffickers post their photos online, authorities can search them against the database and therefore use it to try and find a match. Everything in the photos that app users submit, from the wallpaper patterns, carpeting, artwork, and the view outside the windows can be used to match and find where traffickers pictures were taken. 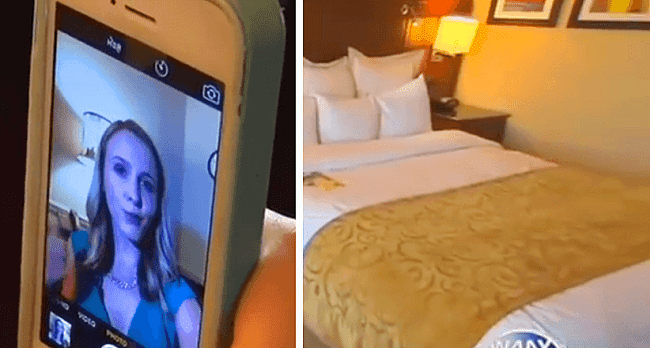 Here's how it works: Download the free app to your smartphone and the next time you stay at a hotel snap 4 quick pictures of your room. When you submit them include the name of the hotel you're staying at and the room number. You can do this when you're leaving and these images are then added to the database. One day in the future, your picture could help to identify and locate victims and their traffickers. It only takes less than a minute and yet it may make all the difference in the world to someone out there who desperately needs help. Please watch the accompanying video for more information on the human trafficking epidemic and how the TraffickCam app works. Be sure to pass this along to friends and family as well, the more people who are aware of the issue and who use the app, the better the chances of it saving lives. If You See One Of These Hooks In A Public Restroom, Call The Police Right Away!